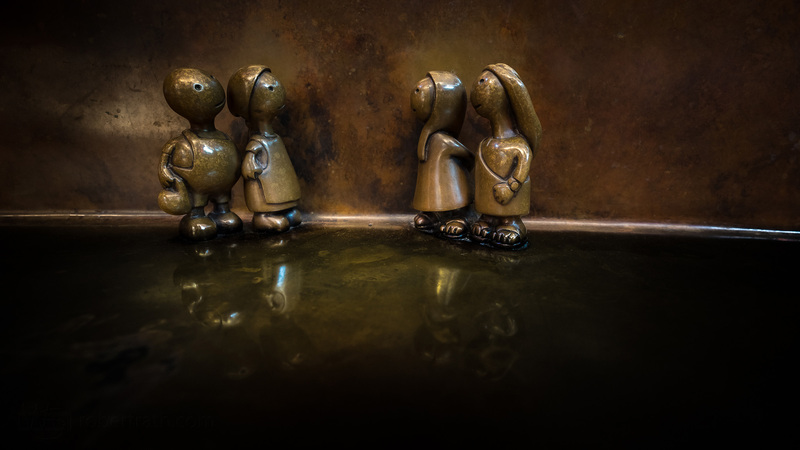 Little bronze personalities came to life in all sorts of nooks and crannies as I continued exploring the ‘Other Worlds’ installation by Tomm Otterness during my Doha transit. The four individuals coming together in this scene particularly caught my attention. The couple on the left appear attired in working clothes, overalls and an apron while the couple to the right appear to be of a different class with the more elegant clothing, sandals and even a wristwatch. Despite their differences I felt that some some cordial engagement was taking place here along with a mutual respect. Perhaps a negotiation or an agreement yet to be made. Perhaps just a meeting of minds.